Posted July 31st, 2018 by Wes DeKoninck in General News. Indiana Tech is in need of Adjunct Professors in their College of Engineering. The positions are mostly for evenings, so this would be an ideal opportunity for any of your employees (or retirees) to get involved with this great Institution. Basic requirements are for a Master’s degree in the instructional area (allotments can be made for equivalent experience in special circumstances). Posted July 30th, 2018 by Wes DeKoninck in General News. The Electric Works team is bringing Travis Sheridan, President of Cambridge Innovation Center’s (CIC) Venture Café Global Institute, to Fort Wayne from August 6-9 to meet with founders and key startup support stakeholders. In support of the Regional Partnership’s Business Attraction and Talent Attraction strategies, we are working with Crystal Vann Wallstrom to help organize meetings and events to get the most out of his visit. Details below. Venture Café started in Boston in 2009 as an informal, organic gathering for innovators. Today it has a network of Venture Cafés in Miami, Boston, Winston-Salem, St. Louis, and internationally in Tokyo, Japan and Rotterdam, Netherlands. They are opening additional locations around the globe in Sydney, Dublin, London, Warsaw, and New York. Their mission is to connect innovators to make things happen and they do that through a public network of spaces and programs to help anyone with an idea succeed. Part of the secret is broadening how innovation is applied, building an inclusive community and connecting locally, nationally and globally. Venture Café is driven by the belief that innovation is a process to improve the human condition and its programs sit at the nexus of innovation, entrepreneurship and economic mobility. Electric Works ultimately hopes to have Venture Café involved and onsite at Electric Works. In addition to one-on-one meetings with Travis, we are helping to host three group breakfast meetings to be held at the Regional Partnership offices (200 East Main Street, Suite 910, Fort Wayne, IN 46802). We hope that you are available to attend one of those breakfast meetings. Posted May 30th, 2018 by Wes DeKoninck in General News. The National Defense Industry Association is hosting the Defense Logistics Agency Land & Maritime Supplier Conference & Expo on June 19th – 20th at the Greater Columbus Convention Center in Columbus, OH. This is a good opportunity for current and potential DLA vendors to discuss future logistics support strategies, challenges and to streamline efforts to better support the Warfighter. Please use the following link to see why you should be attending this supplier conference. There are still plenty of booth spaces available. Register now. Last Chance To Register for the Northeast IN Technology Commercialization Forum! Posted May 29th, 2018 by Wes DeKoninck in General News. The Northeast Indiana Technology Commercialization Forum is focused on sharing insights into how to build successful companies by commercializing intellectual property. The defense, technology, entrepreneurial, and economic development community of Northeast Indiana is invited to a forum focused on sharing insights into how to build successful companies by commercializing intellectual property. Monday, June 4, 2018, 11:30 a.m. – 1:00 p.m.
Posted April 26th, 2018 by Wes DeKoninck in General News. 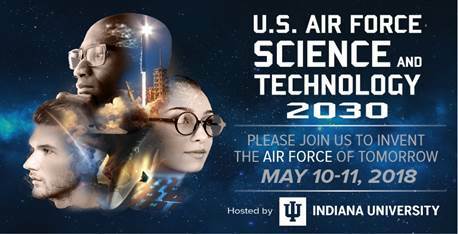 On May 10th and 11th, Indiana University is hosting one of the Air Force’s Science and Technology 2030 workshops. The purpose of the workshop is to collect ideas from academia, small business, and industry from across the Midwest to help inform Air Force investment priorities in basic and applied research over the coming decade.